With the students on their summer holidays the University of Edinburgh surrenders wholeheartedly to the festival season. On Bristo Square the student union houses the Pleasance Dome, with five venues offering theatre and comedy. 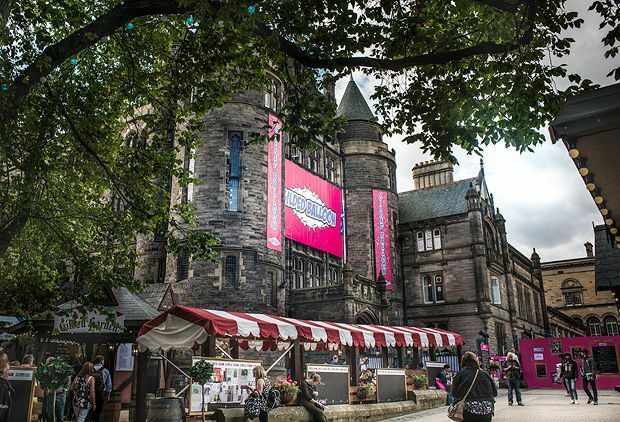 Over the road is Gilded Balloon Teviot, a neo-gothic mini castle houses nine performance spaces and is surrounded by the food stalls and bars of the Gilded Garden, which is guarded by a suit of armour. Down at George Square, Assembly have George Square Theatre, Studios and Gardens. The Gardens venue is home to a variety of tardis like spiegeltents where you can see children's theatre, cabaret and music. Also on the square is Underbelly George Square, where shows take place inside a giant, upturned, purple cow. Exit the square onto Middle Meadow Walk to find the sprawling green of the Meadows. Visit on a sunny day and you'll think the city has reverted to smoke signals as a mode of communication, as disposable BBQs pump out haze. It's legal to drink outdoors in Edinburgh, the rest of the country isn't trusted, so it's a popular outdoor spot to enjoy a cider or two on the grass as cyclists whizz by. Last year the Meadows hosted the first major venue dedicated to circus and Underbelly's Circus Hub returns again for 2016. On the east side of The Meadows Summerhall, housed in a former Veterinary College, is a good option for those wanting to sample a variety of performance genres without changing venues. So is the Pleasance Courtyard, where queuing for the seventeen different venues has been perfected to an art. Just along from the Pleasance is Zoo's studio theatres, offering physical theatre, dance and new writing.